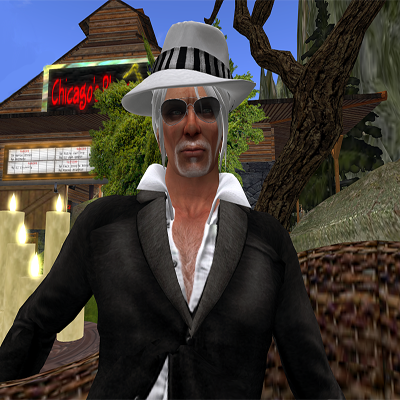 Chicagosax Resident is one of the fastest rising stars on the Second Life (SL) live musical performance scene to date. Taking into consideration of his musical expertise, it easy to understand why. Chicagosax is known in real life (RL) as George Buetow, a founding member the 1960’s garage band "The Missing Link"s.
This group of 4 talented musicians used self-development and discipline to work their way up the Chicago music scene, and opened for the Rolling Stones in 1965. The group was later reformed in 1968, and those members became the group known around the world as "Chicago". With all that musical background, it is no wonder why his venue, called Chicago's Place, is a popular place for music lovers to congregate. Together with a team of highly skilled professional consultants, Chicagosax carefully planned out the venues design, sound business practices, and talent searches to ensure a high quality musical experience. Chicago's place currently has 11 performers. With only 3 of them being Djs, the venue is jumping with live performances featuring Jazz and Blues shows as well as Pop/Rock shows. There are also some exciting professional artists who are about to make their Second Life debuts in the next few months live at Chicago Place. In the near future, The Chicago's Place exclusive VIP section will be open. This will be a place where performers will be able to have small private concerts, where the artists talks to their audience about their experiences in the music business. I was lucky enough to get a sneak peak of this VIP section along with a grand tour of the venue when I met up with Mr. Chicagosax earlier this week. Truly being humbled by the fact that he took time out of his busy schedule to show me around and answer a few questions. Sunny: Hello Chicagosax. It is a pleasure to meet you, and thank you for inviting me to your club. I am just in love with this lakeside view. Well, let’s get started. You are a well-known musical performer in real life. How did becoming a musician in second life come about? 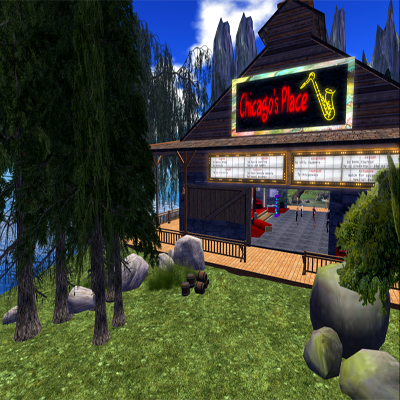 Chicagosax:Yes…..I'm a performing musician in RL, and have played with a few SL performers. One of whom explained SL to me, and my natural inquisitiveness caused me to join. I performed early in my SL life, and then stopped for a bit to try to gain a better feeling for performing in SL. I did this by attending various SL singers' and musicians' shows. Sunny: You performed early in your Second Life? How did it turn out? Chicagosax: I actually performed at my own club about 90 days after joining SL. I had already become friends with several people, musicians and whatnot, and invited them to attend my -- shall we say -- "debut". The performance went well, and I gained a wealth of information from the feedback of those who attended. Sunny: How did your 1st virtual performance differ from your 1st real life performance? Chicagosax: Well, my first real life performance at an actual venue, (not counting a few years of playing with a band at various family functions like birthday's weddings and anniversaries) was in a bar in the Chicagoland area, I was 14. During breaks, the club owners made me sit in a booth in the dark so I wouldn't be noticed. I was also taught to be respectful and told not bring my baseball and glove to the performance - lol. Sunny: What do you enjoy most about performing in second life? Sunny: I am fascinated with your real life musical achievements. You have a degree in music, which has led you to have studied with many notable players in Chicago. Care to mention a couple? DePaul remains a respected institution for music education. Sunny: WOW that is awesome. Being the owner of Chicago Place, a hot place for music acts in Second Life, who, would you say, are some of your favorite acts performing there now? Chicagosax: All of them….of course. We bring in the best talent available whose musical genre and schedule coincides with ours. We're interested in providing a club in which people can hear the best music, take advantage of our excellent dance chims, and chat with friends or meet new friends in a comfortable atmosphere. Sunny: LOL Great answer. Are you currently looking to add more acts to your line up? Chicagosax: As schedule and budget permits, we are always interested in exploring new talent whose music fits our theme of Blues and Jazz peppered with a bit of Pop music. Sunny: Can you tell our readers about an upcoming event they need to be sure they don’t miss? 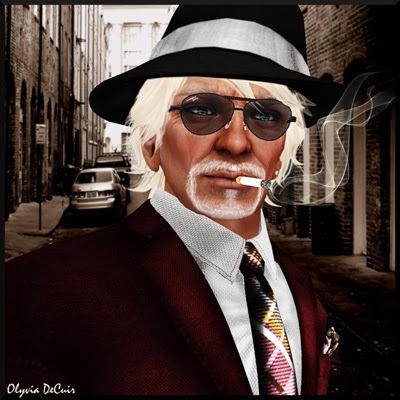 Chicagosax: The VERY POPULAR Wayne Davis band will be appearing at the Chicago's Place every Monday at 10 PM SLT starting June 16th for a long term engagement. Wayne Davis's addition to the Monday evening line-up of great talent will surely create a mix……a mix that all will enjoy. Sunny: That sounds wonderful. If our reader wanted to know about other upcoming events where could the look? Chicagosax: Right now the event calendar contains the best information. We've started a Facebook page and a Calendar/Schedule of events. It contains dates and locations of my performances and our offerings at Chicago's Place are NOW listed my on the website www.chicagosax.com. Sunny: I would like to thank you for inviting me out, but before I go I always like to ask an off the wall question.....so here is goes........What is a genre of music people would be surprised to hear that you enjoy? Chicagosax: House music. The type that would be heard in Miami's South Beach, or the dance clubs in Europe, interests me. Electronic technology has helped created a new genre, of music incorporating dance-able rhythms. And sounds created by synthesized instruments and performed by creative artists. However, I don't enjoy rap or Hip hop, It's about my personal taste, and have nothing bad to say about this popular genre. Sunny: Thank you for your time, Mr. Chicoagosax. It has been a pleasure interviewing you.